In 2018, the Otsu Matsuri Festival will be held on Oct. 6th and 7th, 2018 (Sat. and Sun.). 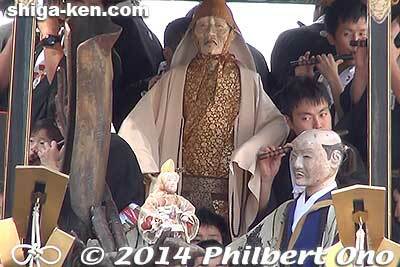 Embedded above is my acclaimed video of Otsu Matsuri (大津祭) filmed on Oct. 12-13, 2013. It’s about 28 min. and the most comprehensive English video about the festival. It includes the Yoimiya festival eve and the festival’s main day. The video spotlights the karakuri mechanical puppets. 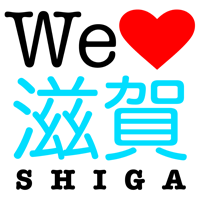 I also got on-camera comments from foreign participants (mostly American, including Shiga’s JET Programme teachers and interns from Michigan who were in Otsu in autumn 2013). Otsu Matsuri is an annual festival of thirteen ornate floats (called hikiyama) held in Otsu, Shiga Prefecture during the weekend before the second Monday of October. It is a festival of Tenson Shrine in Otsu. It’s not known for certain when the festival started, but there is a historical record indicating that the festival started having a float(s) around the late 16th century or early 17th century about 400 years ago. In 1596, a neighborhood salt vendor named Jihei (塩売 治兵衛) wore a tanuki mask and danced during a Tenson Shrine festival. People liked his dancing so much that they built a float two years later and Jihei danced on it. Him dancing on the festival float continued for over ten years after which his old age prevented him from continuing. 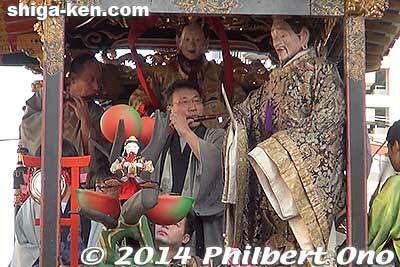 A tanuki karakuri puppet was then used in his place on the float. More floats were added and a total of 13 or 14 floats were originally built during a period of 141 years from the 17th to 18th century. Each one belongs to a different neighborhood in central Otsu. The floats are wooden, about 6 to 7 meters tall, and has three large wooden wheels instead of four (like Kyoto’s Gion Matsuri floats). They are gorgeously outfitted with intricate wood carvings, tapestries (from China, Korea, and even Belgium), paintings, and other art work. Art museums on wheels. 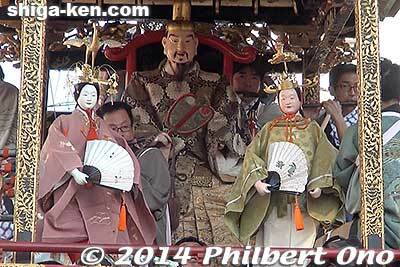 One highlight of the floats and festival are the traditional karakuri mechanical puppets. 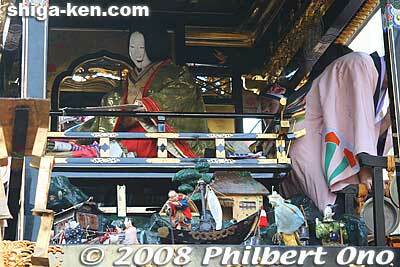 Each float has elaborate karakuri puppets depicting a scene from a Noh play or Chinese legend/myth. Although the characters and stories are well known in Noh or Chinese mythology, you would have to know the Noh story or Chinese legend/myth to understand it. The puppet performances are short, lasting only a minute or two. This post gives a synopsis of the stories behind the karakuri puppets on all thirteen Otsu Matsuri floats. Saturday is the Yoimiya (宵宮) festival eve when the thirteen floats are displayed and paraded around their respective neighborhoods in the afternoon. The floats are then festooned with paper lanterns. From 6 pm to 9 pm, the paper lanterns are lit and festival musicians play on or next to the floats. The sound of flutes, taiko drums, and bells fill the air. 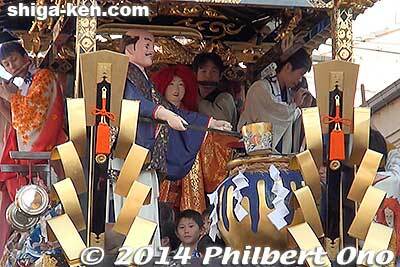 Also, the karakuri puppets are removed from the floats and displayed in homes on the street. You can see them up close. Since all the floats are clustered along the streets near JR Otsu Station, it’s easy to see all of them. Not crowded at all. On Sunday the next day, the Hon-matsuri (本祭) is the main festival day. The thirteen floats are paraded in central Otsu from 9 am to 5:30 pm. 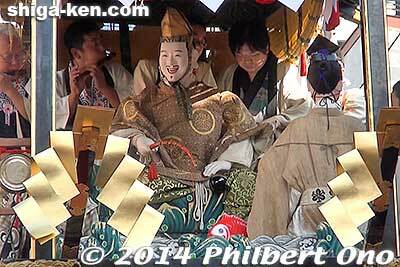 The procession starts at Tenson Shrine and the floats stop often to give karakuri puppet performances. The procession is led every year by the Saigyo-zakura Tanuki-yama float with a stuffed tanuki (raccoon dog) on the roof serving as the festival guardian. The order of the other floats is determined by drawing lots. So every year, the order of the floats in the procession (junko 巡行) is different. 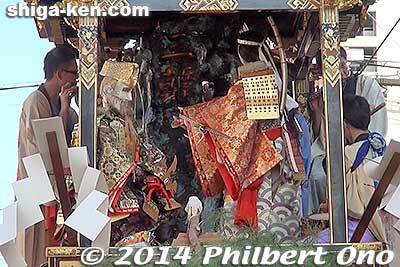 Another highlight is the floats throwing chimaki which are small bundles of straw. A chimaki supposed to ward off bad luck, so we all want to catch one. You hang it above an entrance or under the eaves. They also throw small hand towels (tenugui). All the chimaki were blessed by Tenson Shrine. The chimaki lasts for one year after which you supposed to return it to the shrine to be burned during the Dondo-yaki Festival. Next to the float’s name, the year it was first built is in parenthesis. 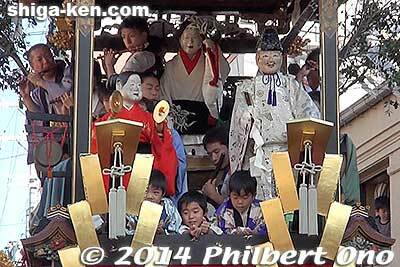 The Video link will jump to the respective float’s karakuri performance in my Otsu Matsuri video embedded above. 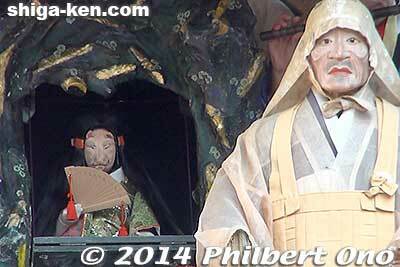 From the Noh play Tsurukame (Crane and Turtle), praying for and celebrating national peace and stability. While celebrating spring, the Chinese emperor at his palace receives well-wishers for his longevity. Then a female wearing a crane crown and a male with a turtle crown start dancing in front of the Chinese emperor to celebrate his longevity. Feeling happy, the emperor also starts dancing. This float is always first in the procession. 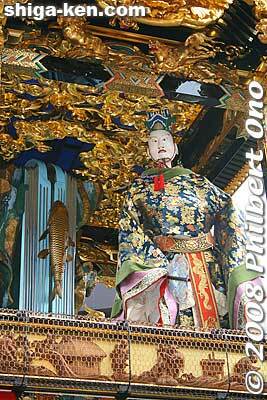 The roof has a stuffed tanuki (raccoon dog) to lead the procession every year as the festival guardian. 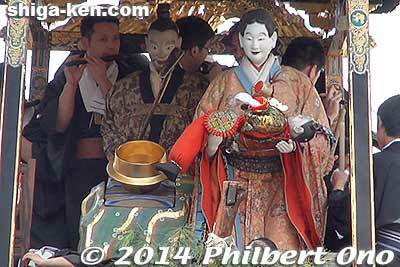 The float is associated with the wooden tanuki mask worn by salt vendor Jihei who started the festival. His original tanuki mask is displayed during the Yoimiya festival eve. In 1596, salt vendor (shiouri 塩売) Jihei (治兵衛) wore a wooden tanuki mask and danced during a Tenson Shrine festival. People liked his dancing so much that they built a float two years later and Jihei danced on it. This was the beginning of the Otsu Matsuri. Jihei danced on the float for over ten years before his old age prevented him from continuing. 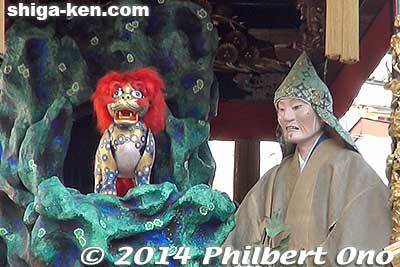 A tanuki karakuri puppet was then used in his place on the float. 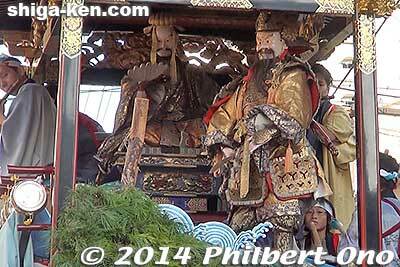 The float is named after Saigyo Hoshi (1118-1190), a famous traveling poet and Buddhist monk. The karakuri is based on Saigyo’s poem and Noh play called Saigyo-zakura. When the old sakura tree next to Saigyo’s hermitage in Oharano in Nishiyama, Kyoto blooms in spring, his lone admiration of the flowers is disturbed by an endless stream of noisy people gawking at the flowers. 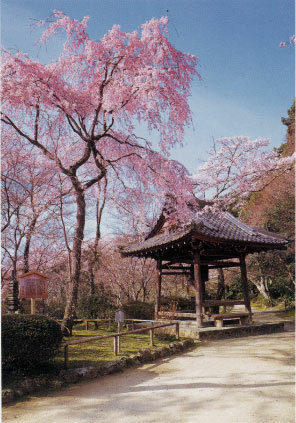 If you visit Oharano in Kyoto, you can see the third generation of Saigyo’s sakura tree at Shojiji temple (勝持寺). The karakuri is from the Noh play Sessho-seki. Tamamo-no-mae was a beautiful courtesan favored by the emperor. But she actually was a nine-tailed fox with golden fur and was out to kill the emperor for an evil daimyo. Her guise and plot was exposed by astrologer Abe no Yasuchika and she escaped eastward to Nasu, Tochigi. Although she was killed, her spirit possessed a stone that killed travelers who touched it. Priest Genno appeased her spirit with Buddhist rituals and she was exorcised from the stone. The karakuri shows Priest Genno who split the killing stone in two and court lady Tamamo-no-mae’s face switching to a fox. The float is named after the famous Noh play Shojo. Takafu (Kofu), who lived near the Yangtze River in China, had a dream telling him that selling saké would be profitable. He followed this advice and his saké sales went well. However, one customer who came every day never got drunk no matter how much he drank. Being curious, Takafu asked the customer for his name. After replying that he was Shojo who lived in the sea, he left. Later on a beautiful moonlit night, Takafu brought some saké to the riverside and waited for Shojo. From the waves, Shojo appeared and they drank the saké together and danced. Shojo praised Takafu’s virtue and rewarded him with a cask that never ran out of saké. Hopefully this karakuri rundown will help you understand and enjoy the festival and karakuri puppets more. Wish I had time to explain about the floats’ tapestries and other art work too, but that will have to occupy a separate post.